Diagram of roof-mounted solar air collector. A solar air heater is a type of solar thermal system where air is heated in a collector and either transferred directly to the interior space or to a storage medium, such as a rock bin. 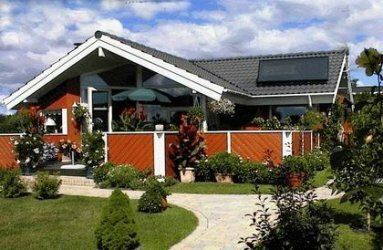 Solar air heaters use solar panels to warm air which is then conveyed into a room. The basic components of a solar air heater include solar collector panels, a duct system and diffusers. Systems can operate with or without a fan. Without a fan the air is distributed by the action of a natural ventilation system. Solar air heaters provide free interior heating to complement conventional climate control systems. It is important to note that the output from solar heaters is reduced when clouds reduce the amount of sunlight. A typical solar air heater collector panel would assist in the heating of a small room. Solar air heating is potentially suitable for any building that requires heating, providing the collector panel can be placed on an appropriate unshaded south-facing (in the northern hemisphere) roof or wall. Solar air heaters cost around $2500, plus installation. The pay back period is around 10 to 15 years when used to complement gas heating systems and five to seven years for electricity and wood.